I think I am setting some sort of personal record...blogging three times in one week! What?! We have 11 days left before testing begins. I can't believe it!!! That means it's time to get in rock star mode in my classroom! We start by making a set list ,like any rock star would do to prepare for the big show. But ours is a set list for success. We talk about what is essential in preparing for and taking a test such as ours and write the set list. We take the SAT10 here in Tennessee. I also have them write a narrative on the steps they will take to ROCK the test and a motivational letter to other students in the school. 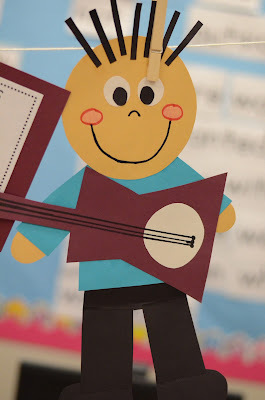 Finally, we make these super cute rock stars! I can't wait to get them up and around my classroom door. The packet these come from are in my TPT store. 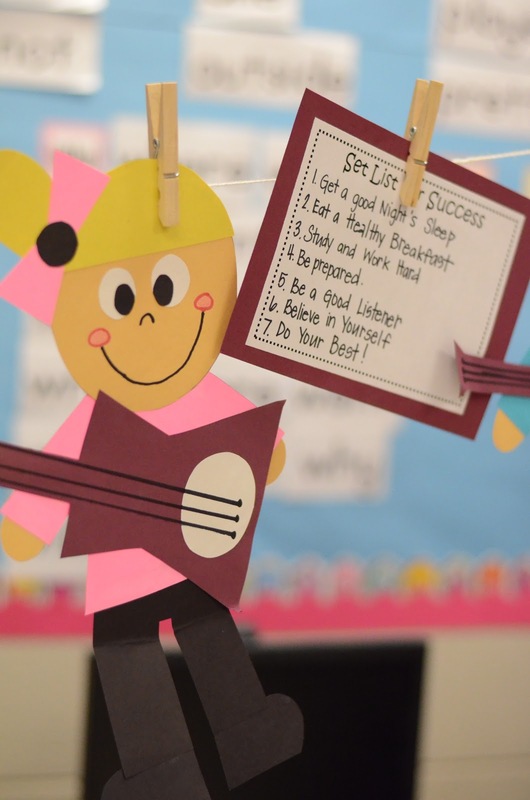 You will also get posters with test-taking tips to hang around your room. We have to cover our walls or take everything down. I buy plastic tablecloths to cover the stuff I don't want to take down and put the signs on top of those. You can click the pic below to see them. We are also going to be busy reviewing over the next couple of weeks. 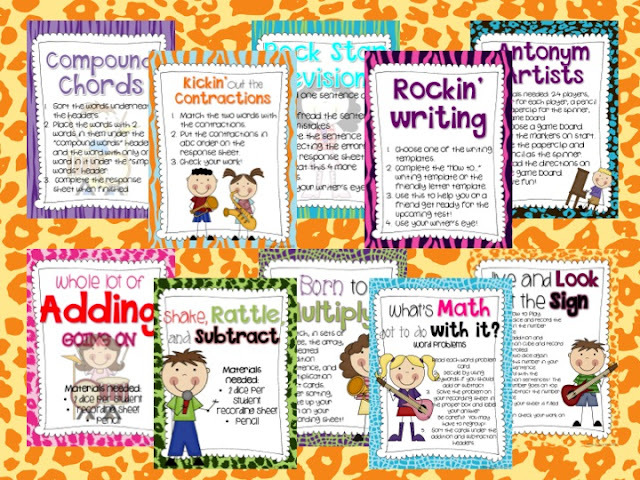 I made up some math and literacy test prep centers covering the skills my students need extra practice on. They cover those huge 2nd grade skills. I am working on another set for the next week that has more to do with comprehension, language, and place value concepts. 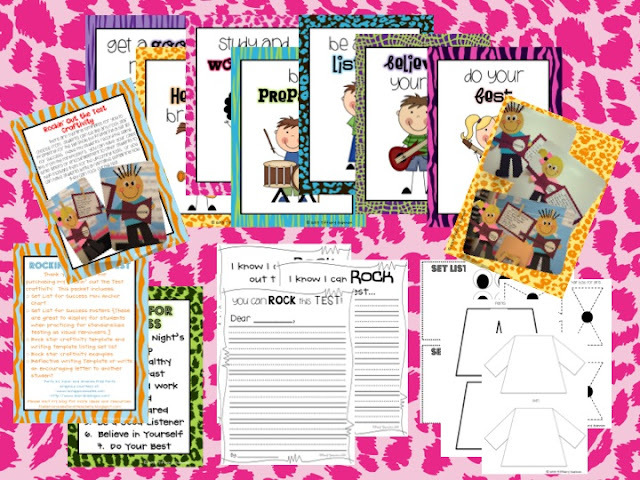 And, of course, these centers will make your littles feel like rock stars with the fun rocking theme. I hope you second grade teachers find the centers useful. I just want our students to be successful and prove how smart they really are on this big test! 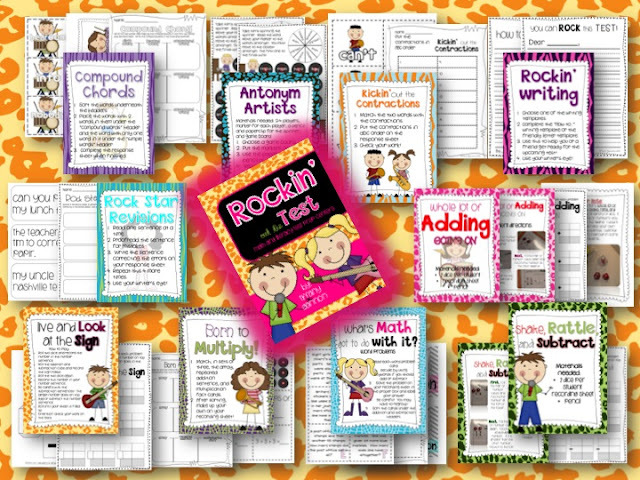 I hope you all "Rock Out the Test" with us! Happy early weekend! These are awesome! I can't wait to check out your TPT store. We will be testing our first graders soon. Those are so cute!! I cannot believe you have 11 days before testing. We don't start the year until after Labor Day, so we have 5 weeks when we get back from break. It can't be that close to the end of the year already, right? What an amazing unit!! I can't help but LOVE the digital animal print pages featured in the preview images. Did you design them or purchase them from someone? Would love to use them for a special project with my firsties! Thank you! You can find them in my TPT store. Just click on the link above in grey or the picture of the unit. Love these!! The kids love seeing them up no matter what grade.